Congratulations to giveaway winner Sarah, @city_sparrow! I know I'm often saying I met so and so on Instagram, but it's true! That is where I first caught sight of the origami and origami-inspired jewelry made by Gavin Canning of FoldIT Creations in Toronto. Incredibly industrious, Gavin is constantly coming up with new and varied ideas. Who doesn't have memories of making paper airplanes as a kid? A nod to simpler times, his playful plane necklaces and earrings are much more refined... in fact, they are hand-folded silver. Since graduating from the Drawing and Painting program at Montreal's Concordia University in 2009, Gavin has traveled far and wide. While in Japan, he was drawn to chiyogami paper and began practicing origami. This led to a colorful line of wearable art jewelry, always made with quality findings. 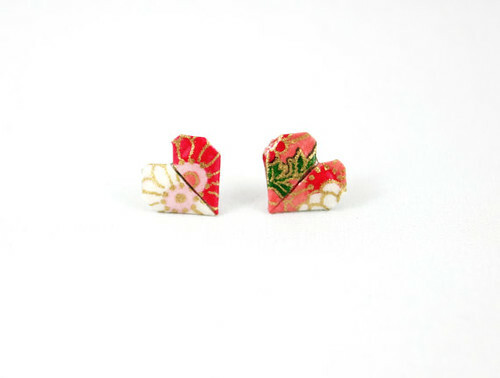 There are origami paper earrings and cufflinks, and origami-inspired wooden brooches. 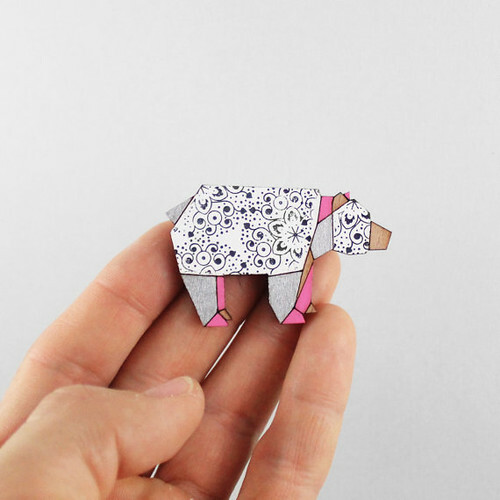 This cute bear makes me smile, and there's also a paper crane or rhino if you prefer. 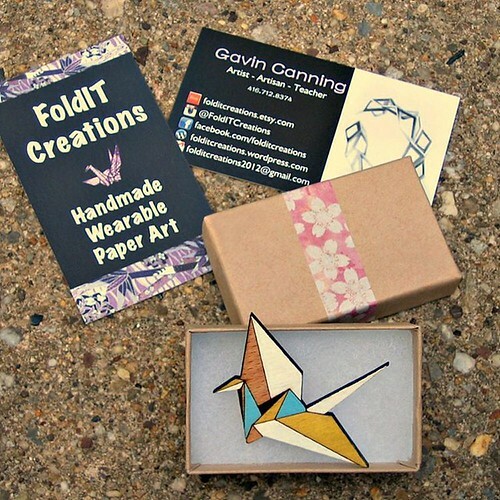 I had the good fortune to win one of Gavin's wooden brooches in an Instagram giveaway which turned out to be an extra good thing because it led to us chatting about a giveaway here at All Things Paper. After seeing the caliber of his work in person, I knew it would be an ideal fit... he hand-painted the perfect design on my paper crane (below)... mad fine motor skills! And speaking of paper cranes, Gavin hand-folds tiny ones from sheets of silver paper clay using a needle and bone folder to do what seems to be nearly impossible. 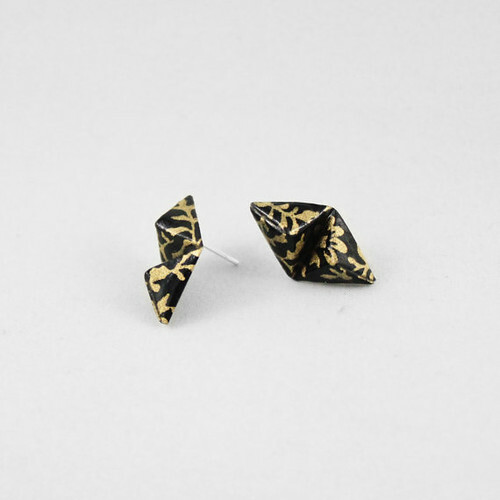 These geometric, silk-screened chiyogami earrings are stylish and can be worn with confidence. The folded paper is coated with layers of clear acrylic polymer for strength and durability, as well as a topcoat of enamel for water resistance. He offers them in many colors and patterns. Remember paper fortune tellers? My friends and I made so many in middle school as a way of determining our futures, but the ones we folded were certainly not silver nor anywhere near as classy. 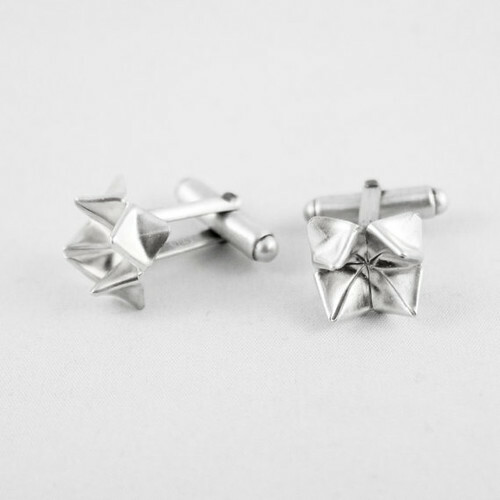 A pair of cufflinks would make a great first anniversary gift since paper is the traditional gift.... you could even attach a note along the lines of "How fortunate we are to have found one another!" Gavin has been utilizing 3D printing, which is how he created this perfect little 10K gold deer. If gold is out of your price range, not to worry... he makes them in silver and brass too. 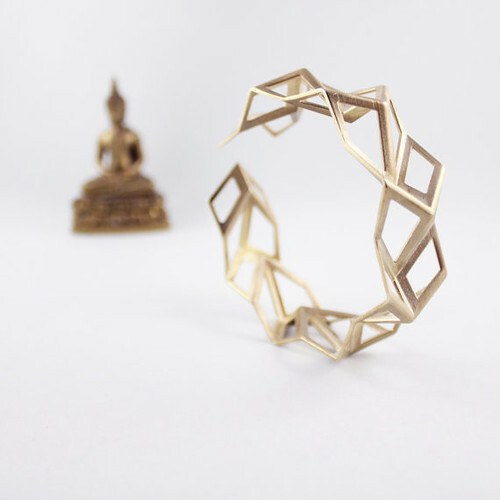 Same goes for this striking tessellated bracelet that is available in gold or brass. These pieces were originally designed in paper, then digitized and 3D printed in wax, and finally cast in metal and carefully hand finished. 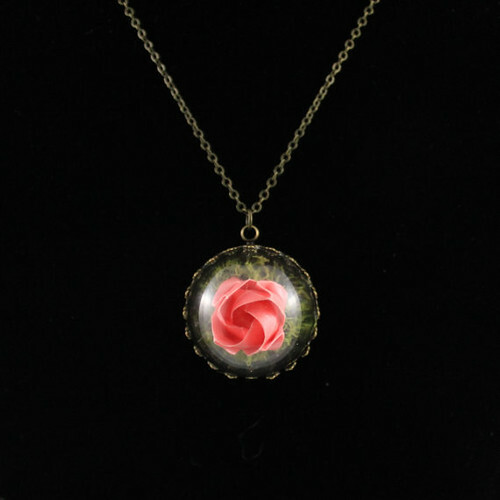 Gavin has a nice variety of popular terrarium jewelry too - necklaces and rings that contain origami roses or cranes. 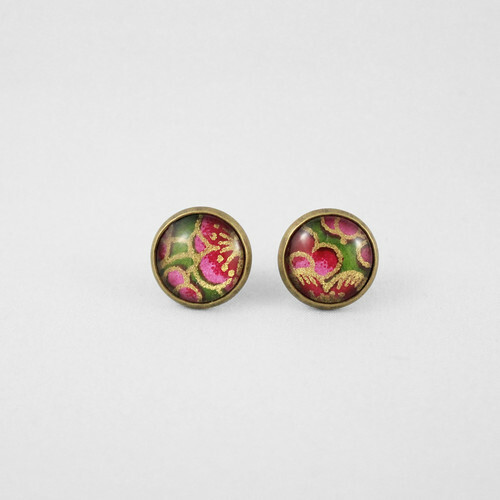 ... or in an antique patina, such as the earrings below. Again, winner's choice. 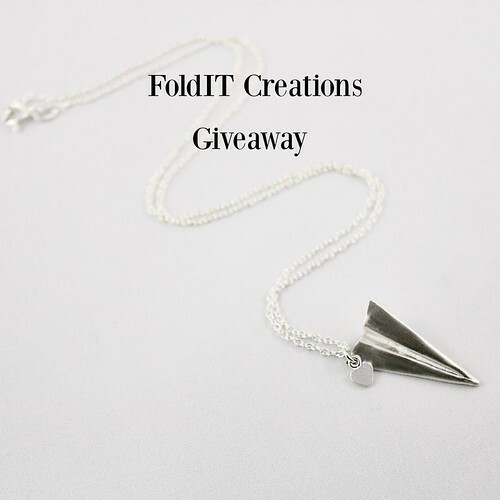 To enter, post a comment below in which you name your favorite item after visiting the FoldIT Creations shop. Be sure to include a way to be contacted within your comment as unfortunately Blogger doesn't allow me to see the entire comment form. If you would rather not post a visible email address, enter your comment here and then send me an email at ann.b.martin@gmail.com so I can contact you if your name is drawn as the winner. If you are on Instagram, you have the option to earn an extra entry via the Instagram giveaway photo. Giveaway ends: Saturday, June 25, 2016. The winner will be announced on this post and on Instagram after she or he has been notified. Good luck! FoldIT Creations is on Etsy, Facebook and Instagram. Gavin blogs at FoldIT Creations. 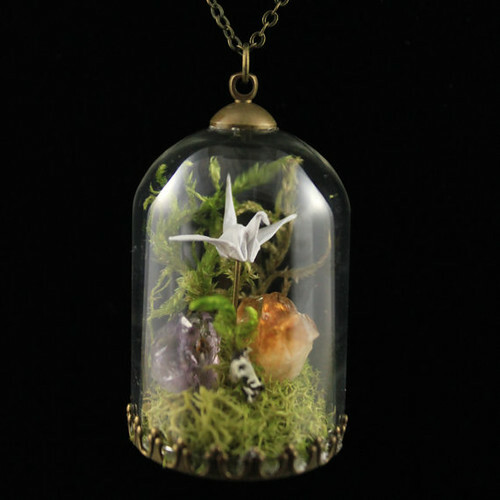 I like the mushroom and crane terrarium pendants. I'm finding 3-D printing so fascinating, and love that it's utilized in these creations. Love that deer...and the domed terrarium too. Definitely the Origami bottle cap terrarium. Although the deer is super sweet. Beautiful work. I love the deer, but so many of the metal origami pieces are wonderful. You can contact me after winning at ds dot acheter at gmail dot com. How can I choose one favorite? I really like the butterfly silver necklace or the whale. 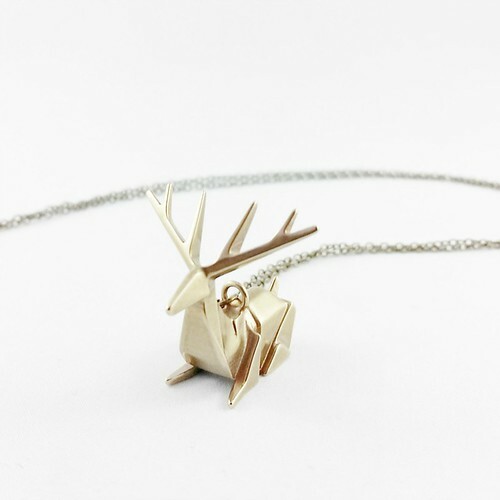 Love, love the deer in the brass form, 3D Printed Origami Deer Necklace—3D printing is amazing. So lovely. My favorites are the deer necklace and the tiny origami dragonfly earrings. Upcycled Map Origami Leaf Earrings...great for road trips.. So many fabulous creations, I had to "add him to favorites" on Etsy!! 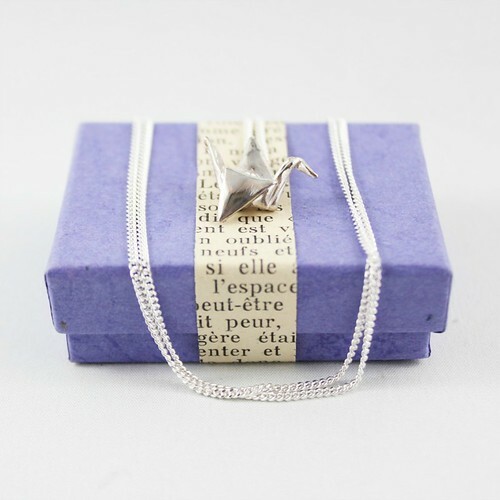 Love the vintage up-cycled map leaf necklace and the origami deer necklace. They're all so clever and unique. Thank you for the opportunity! Amazing detail !! I really like the silver crane, and the small crane in the dome ! My fave is the paper airplane necklace. How cute! 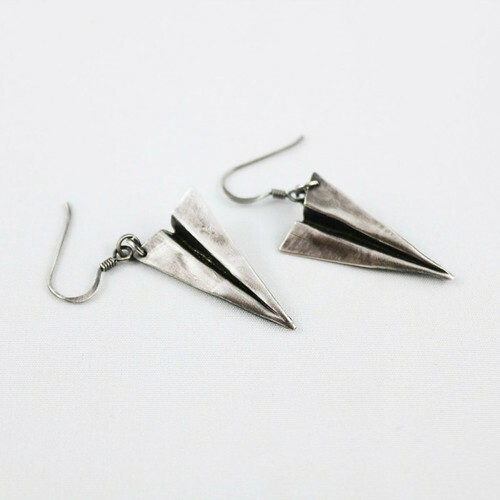 I love the Hand-Folded Silver Origami Earrings with Labradorite, they are gorgeous! cupcake97201 ( at ) yahoo (dot) com. I did the Instagram entry as well, I am @echilt5 on Instagram. I like the sweet origami love ring, thank you. I am a card maker and did not think I would have time for learning anything else, but your blog is something I can not pass up. I will be buying supplies tomorrow so I can learn to do paper quilling as a beautiful addition to my cards. Thank You. beejoyful@comcast.net Holly Orr. This is fabulous! Loved silver crane and gold deer and silver leaf earings. What wonderful work. My son has done origami most of his life so I love the silver crane cuff links (earrings and necklace too). I really like the Paper Crane Terrarium necklace. But I would wear it as an earring instead. I like really big earrings and I'm only pierced in one ear so it looks really nice with one big earring.